Unfortunately we couldn’t get past the introduction to this wine book without realizing we were in way over our heads. 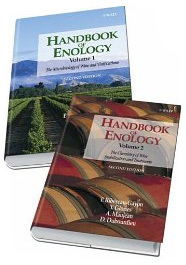 Unless you are studying at UC Davis for your degree in Enology, know or care what Rhamnosylquercetin is, or can draw the schematic for how damascenone is formed in grapes and wine then this book is not for you. Alternatively if you are concerned your friends are becoming more wine knowledgeable than you are; you could buy this book and place it on the coffee table to scare them. Otherwise save the $300 and spend it on a good bottle or bottles of wine.